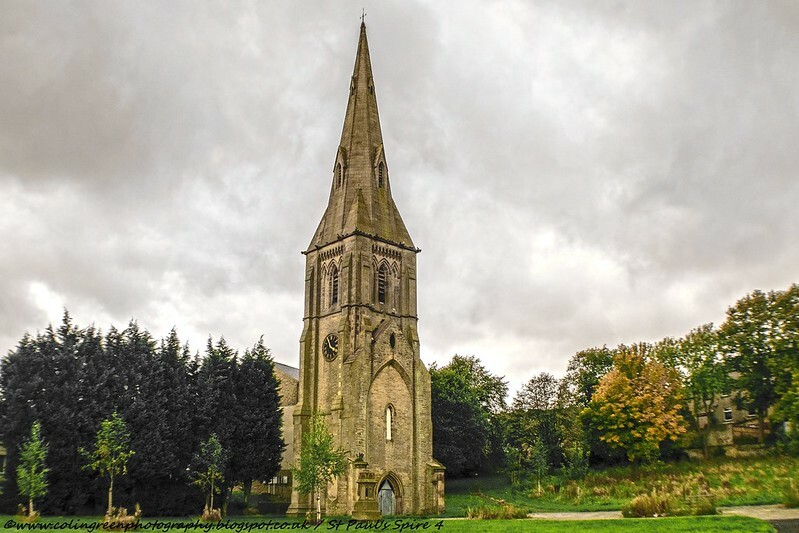 Colin Green Photography: St Paul's Spire, King Cross, Halifax. St Paul's Spire, King Cross, Halifax. St Paul's Spire is all that remains of the former million pound church opened in 1847, which closed in 1912 and was demolished in 1931. The spire is Grade II listed and sits inside the former burial grounds which are now a rest garden. Burials continued to happen within the grounds until 1969. I understand that the bodies are still buried within the grounds, with just the headstones being removed and repositioned. The pictures available to view on Flickr and Clickasnap were taken on the 3rd October 2017 with Nikon d3300 SLR Camera. Click the link below to view the picture that is exclusive to Flickr which will also be available as a download shortly. Click here to view my "St Paul's Spire" picture on Clickasnap. By viewing this picture and any others on Clickasnap for over 5 seconds you help support the photographer. The following information was taken from Wikipedia on there page about King Cross. Click here to view the page about KIng Cross on Wikipedia. I will remove the following information if requested and thank them for the use of it here. A Commissioners' church, St. Paul's, designed by Robert Chantrell in 1845, was built in 1847, with seating for 450 people. By the end of the 19th century, with a population of some 17,000 people, the older church of St. Paul's, built in 1847, had eventually run out of space for burials. A decision was made in 1909 to build a new church designed by Sir Charles Nicholson, with seating for 1,000, nearby. Except for the tower it was completed in 1912. Following a fire in the old St. Pauls in 1930, during which the roof was destroyed, the building was demolished in 1931, leaving only the tower and spire standing. With the increased space burials continued in the graveyard until 1969. With some 1,737 graves in the graveyard the church asked the local council to take over the maintenance of the grounds. The area was eventually designated as a 'rest garden' in 1973, though with some considerable controversy.